The awareness and eagerness to adopt energy management system (EnMS) are very intense in the present year 2012, the launch of ISO 50001 being a timely follow wind. Like other nation Indian industries too faces economic hurdles. Top management of companies and Government focusses energy management to be the positive effect to turn around the economic stagnation. 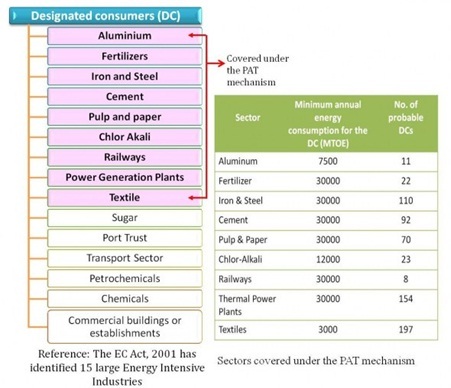 Government of India enacted Energy conservation Act 2001 amendment 2010 to provide legal framework and the institutional arrangement for enhancing energy efficiency. This act led to the creation of Bureau of Energy Efficiency (BEE)as the nodal agency in the centre and state level to implement the provisions of Act. The missions of BEE is to develop policies and strategies based on self regulation and market principles with the goal of reducing energy intensity of the Indian economy. They have committed to generate more energy managers and energy auditors. They are conducting training and free distributing free e-books/guidebooks on energy management through their website. Additionally, BEE has enacted PAT( Perform. Achieve and Trade) in march 31st 2012, where in 8 industry sectors (Govt. has excluded Railways for the timebeing) have been identified and plant wise Sp. energy norms set, which they have to achieve in 3 years. The Green IT Promotion Council (GIPC) of its secretariat at Japan Electronics and Information Technologies Association (JEITA) during the seminar had announced the availability of "RENKEI Control Guidebook" English version. 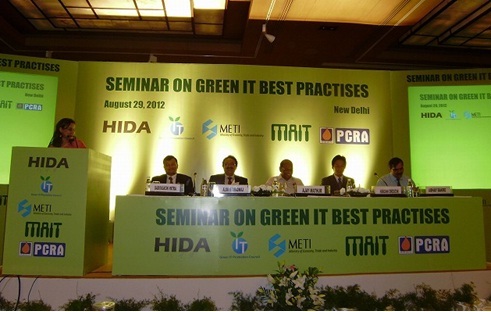 On 31st August, The Manufacturers’Association for Information Technology (MAIT), the apex body representing India’s ICT hardware, training and R&D services sectors organised the Seminar in Delhi on Green IT Best Practices in association with HIDA (the Overseas Human Resources and Industry Development Association) of Japan, GIPC (Green IT Promotion Council), METI (Ministry of Economy Trade & Industry) and Petroleum Conservation Research Association (PCRA). The guidebook was distributed during the seminar by GIPC representatives. 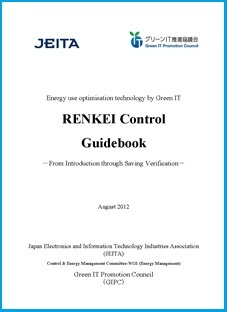 The guidebook is to provide useful information and examples of various applications related to the energy performance improvement technique called "RENKEI control". The Japanese word "RENKEI" literally translated as "cooperation or coordination" which suggests that "RENKEI control" is to pursue energy efficiency optimisation with two or more elements interacting within one another to provide the most efficient and effective result from the control. The RENKEI control concept is a consolidation of a long time energy efficiency experience and accumulated knowledge in Japan with a smart utilisation of “Green IT” concept. The “Green IT” concept provides energy users with opportunities to achieve energy performance improvement without having to go through a major renewal or significant changes in existing facilities. The RENKEI control which is an integral part of energy management operation in this guidebook closely follows the recently focused guidelines such as ISO 50001 International Standard for energy management system and the guideline of IEC for automation controls for energy efficiency. The RENKEI control concept was developed by the JEITA Control & Energy Management Committee WG1 (Energy Management working group) members compiling their intellect and know-how with immeasurable effort. The guidebook of the japanese version was published in January this year. The guidebook in English was produced under the METI Commissioned Project "Support for IT utilization aimed at fostering a knowledge economy in Asia (promoting Green IT)" by GIPC of JEITA, and completed in August in time for the introduction in India. As the RENKEI control aims to provide the ultimate solution for energy performance improvement under the energy management operation, it was a great honour for EnMS-Doc to have taken part in the translation of the guidebook comissioned by GIPC. The full content can be downloaded from the JEITA or GIPC websites.